The Danes can advance from Group B if they achieve a better result versus the Germans this evening than the Portuguese can manage against the Dutch. Got that? Morten Olsen: on the brink. DENMARK COACH Morten Olsen will achieve one of his greatest managerial feats if he can secure a Euro 2012 quarter-finals berth for his country today. Olsen has been in charge of Denmark’s national team since 2000 and his side’s impressive form so far has the Danish FA (DBU) already talking about another contract extension. With four other countries at the European Championships reportedly interested in Olsen, the DBU want to secure Olsen as Denmark’s head-coach beyond the 2014 World Cup when his current contract expires. Denmark shocked the Netherlands 1-0 in their opening Euro 2012 match and then fought back from two goals behind against Portugal to equalise before eventually losing 3-2. The Danes can advance from Group B if they achieve a better result versus the Germans this evening than the Portuguese can manage against the Dutch. 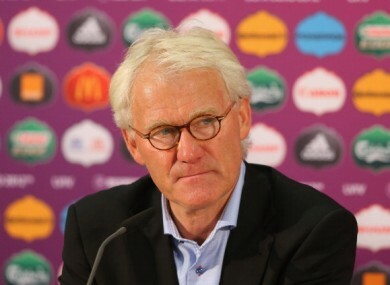 Olsen, who is one of the longest-serving international coaches, would undoubtedly consider a quarter-final berth from Euro 2012′s ‘Group of Death’ as one of his better achievements. Denmark have received a boost ahead of the game in Lviv with midfielder Niki Zimling showing good signs of recovery at training after he had to be substituted early against Portugal with a leg injury, although veteran winger Dennis Rommedahl has not trained since he limped off against the Portuguese. Zimling has been crucial to Denmark’s well-organised defensive structure, working hard alongside William Kvist in the centre of midfield. But Denmark will be wary of their southern neighbours, who cruised to a 2-1 victory over the Netherlands on Wednesday. Mario Gomez looks set to cause Danish central defenders Simon Kjaer and Daniel Agger plenty of problems as the Bayern Munich striker has scored all three of Germany’s goals so far at Euro 2012. Gomez’s two goals against the Dutch were top-class with the 26-year-old turning brilliantly in the box to finish calmly past Maarten Stekelenburg, before smashing a strike into the top corner from a tight angle to give the Germans a 2-0 lead. Despite winning their first two matches in Group B, Germany could still miss out on the quarter-finals if they lose to Denmark by two goals or more and Portugal defeat the Netherlands. Email “Preview: High-scoring Germans out to down Danes”. Feedback on “Preview: High-scoring Germans out to down Danes”.